A year's worth of novellas from twelve inspirational romance authors. Happily ever after guaranteed. Can she forgive the man who left her at the altar? Alyssa Pennington dated Brendan Myers for three years before she accepted his proposal. For almost a year, Alyssa's friends and family helped her plan a lovely wedding to take place in the church she'd grown up in. It was the happiest day of her life when she walked down the aisle to be united with the man of her dreams. But when Brendan left her at the altar, Alyssa was consumed by humiliation, embarrassment, and a broken heart that wouldn't allow her to trust anyone. Especially Brendan. Brendan Myers knows he will spend the rest of his life regretting what he did to Alyssa, the only woman he's ever loved. Without her, his life is empty. In one fateful moment, he'd panicked, destroyed their future, and ruined everything. Now he plans to win her back. But winning back his bride might prove much more difficult than he can imagine. And even if he does get her to the altar again, will she think turnabout is fair play? I cannot begin to say how much I've enjoyed this series of books. So, it's no big shock when I was offered this one, I jumped on it. Not only that, but I downloaded it immediately and had it read in a couple of hours. Seriously. Best part? I wasn't disappointed. 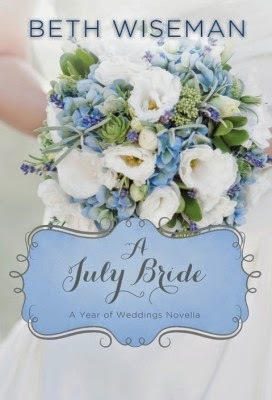 A July Bride gave me everything I love in a novella. It flowed beautifully, the characters were real and their story one that intrigued me. If you get the chance, pick up this novella and enjoy another love story.